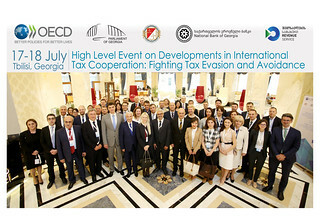 20/07/2018 – Over 70 participants from 20 countries in Europe and Central Asia gathered in Tbilisi, Georgia, for a high-level regional event on Developments in International Tax Co-operation: Fighting Tax Evasion and Avoidance on 17-18 July 2018. Over two days, participants discussed policy responses to fighting tax evasion and avoidance, as well as the opportunities and challenges presented by the practical implementation of international standards on tax transparency and base erosion and profit shifting. The event was jointly hosted by the Ministry of Finance of Georgia, Parliament of Georgia, National Bank of Georgia and Georgia Revenue Service in co-operation with the Organisation for Economic Co-operation and Development (OECD) and the Global Forum on Transparency and Exchange of Information for Tax Purposes. The meeting brought together the ministers of finance and taxes, heads of tax administrations, chairs of parliaments and parliamentary committees dealing with tax matters, governors of central banks and senior officials of ministries of finance and tax administrations from Albania, Armenia, Azerbaijan, Belarus, Bosnia and Herzegovina, Estonia, FYROM, Georgia, Italy, Kazakhstan, Kyrgyz Republic, Lithuania, Montenegro, Romania, Serbia, Slovak Republic, Slovenia, Sweden, Tajikistan and Ukraine, as well as representatives of international organisations providing technical assistance, such as Asian Development Bank, International Monetary Fund and the World Bank. In his opening remarks by Mr. Ivane Machavariani, Minister of Finance of Georgia, noted "when implementing the new initiatives we should not underestimate the importance of regional and political context to ensure that our efforts are successful and results-sustainable. We should tailor our approaches taking into consideration the regional specificities and dynamics. This meeting is yet another opportunity to discuss the events also from the regional perspective and to focus on our priority areas, involving different stakeholders". The Director of the OECD Centre for Tax Policy and Administration, Mr. Pascal Saint-Amans, emphasised the importance of international tax co-operation and co-ordination for addressing tax avoidance and evasion effectively, both at the global and regional levels. Among priorities identified by the participating jurisdictions were tackling the informal sector and ensuring tax administrations have reliable information available to them by implementing the international tax standards, including automatic exchange of information. Delegates also discussed the implementation of measures to address Base Erosion and Profit Shifting, including those on harmful tax practices, treaty shopping, the use of country-by-country reporting information and improving dispute resolution, focusing on the specific issues faced by developing countries.